This book is written by Dr. David C. Gibbs, Jr., the founder, and president of the Christian Law Association (Seminole, FL), and by Jerry Newcombe, the senior producer of the award-winning The Coral Ridge Hour. 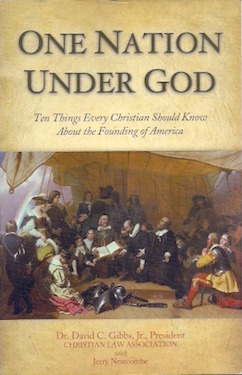 Read the history surrounding the first amendment and it is very clear that the founders intended that we would never establish a national state-church like they have in England or other countries in Europe, from which the original settlers fled. But the founders clearly intended that religion and morality would help undergird the American experience. As George Washington said in his Farewell Address, religion and morality are indispensable supports of our republic.